It’s best if you go to Key West with the right attitude. Yes, it’s crowded. Yes, it’s touristy (for which we acknowledge our share of blame). Yes, it’s kitschy. Yes, it’s overpriced. But if you accept Key West for what it is and enjoy the kitsch, it can be a joy. Key West was the last stop on our cruise and the one I was most excited about. I love Key West, not for its current alcohol-infused, Jimmy Buffet-infused incarnation, but for its rogue, pirate past. It has an awful lot of history packed into its seven square miles. We had about six hours in port and I was determined to make the most of them. Both Patricia and I had been there before and didn’t feel the need to repeat some of the more popular sites, so that freed up a lot of time to visit the places we hadn’t seen before. Map in hand, we hit the shore running. The cruise ship parked almost directly behind the circa 1891 Key West Customs House, now home to the Key West Art and Historical Society, and we started there with its art and history museum. It was a rerun — the only one on our agenda — but an art and historical society museum … how could we not. Both the art and history were local. Something I’d never noticed before: there seems to be quite a bit of Spanish influence in the local art. The first Europeans on Key West were the Spanish in 1521 and but it’s never been dominated by any one culture. The British have owned it, the Spanish have owned it, the Americans have owned it but culturally, it’s always been a mix. The history part of the museum didn’t have pirate objects or stories, at least that I saw. The bulk of the history exhibits cover the Civil War through the 20th century. Florida succeeded from the Union and many on Key West were Confederate sympathizers, but the island was home to a Union naval base and so remained in Union hands. 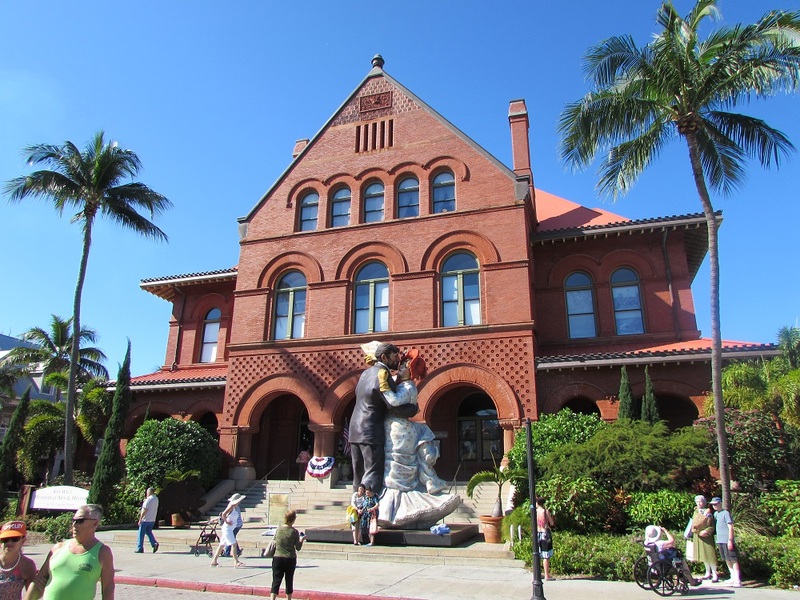 In the late 19th century, the island became the center of the cigar making industry and Key West became the largest and wealthiest city in Florida. Across the street from the Customs House was the Audubon House and Gardens, open for tours. It has a gallery of John James Audubon works in a separate building next door, but otherwise has only a tenuous connection to the artist. 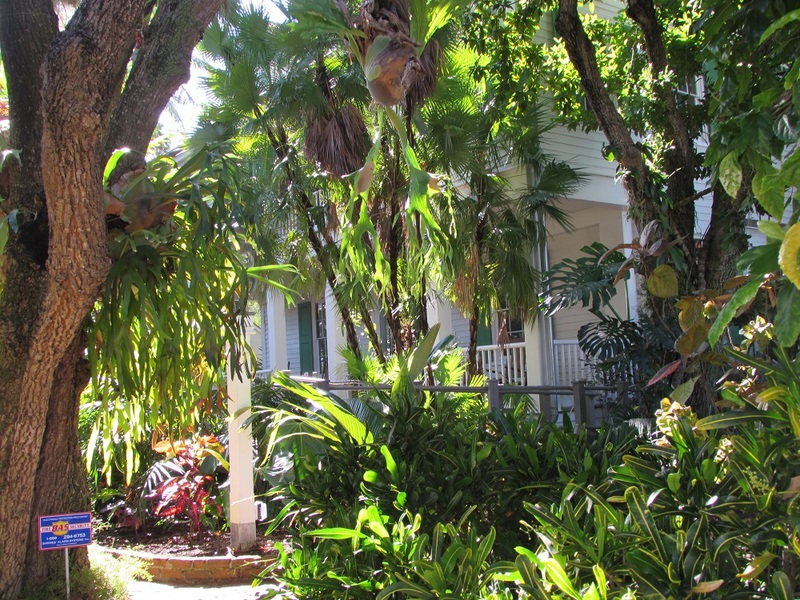 Audubon visited and sketched birds on Key West in 1832, and apparently liked the plants in the garden of the house enough to use them as background in some of his drawings. But mostly, it’s just a beautifully restored mid-18th century house. We didn’t visit because we’d been there before, but certainly would recommend it if you haven’t. Our next target was the Key West Cemetery and we passed by a bar or two or a hundred on our way there. 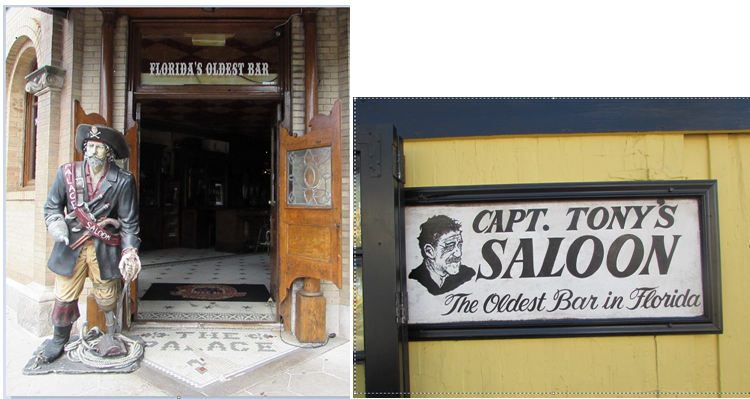 One that caught my eye was Captain Tony’s, not because Hemingway was said to have been a regular (anecdotes told would have us believe that Hemingway drank like George Washington slept: everywhere) but because of a sign on the front. The Oldest Bar in Florida it said. The sign looked familiar. Then I remembered: in October, on Amelia Island, I’d seem a similar sign on the Palace Saloon. Florida’s Oldest Bar it had said. What, I wondered, was the difference between The Oldest Bar in Florida and Florida’s Oldest Bar? Other than a preposition. We didn’t have time to stop, so we never found out. We turned south on Duval Street, the town’s main tourist shopping drag, and we admit that we let the bright, shiny objects in one window waylay us. One eye on the clock, we did some power shopping. As we were checking out, we asked the clerk for a lunch recommendation. “Do you want fast or Key West?” she asked. 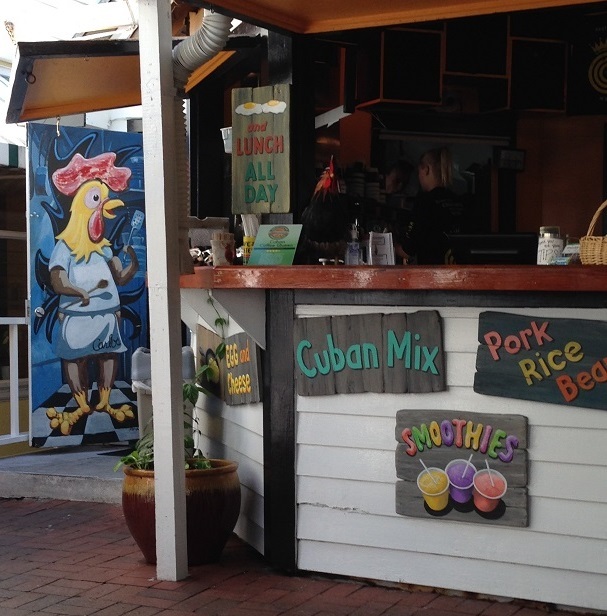 As much as I wanted to say “fast,” sanity prevailed and we said, “Definitely Key West.” She sent us to the Cuban Coffee Queen, a carry-out with tables, down an alley and in the shade. Service was slow but the food was worth the wait. Topped off with some iced Cuban coffee, we were ready to go again. Gallery | This entry was posted in Florida and tagged Audubon House and Gardens, Cuban Coffee Queen, Key West Art and Historical Society, Key West Customs House. Bookmark the permalink. The Keys are beautiful, and a lot of fun. I’ve kept up with yours but haven’t had the chance to respond. Have particular interest in your question about “should writers try to write in a period appropriate style” so will backtrack to respond to that one soon. 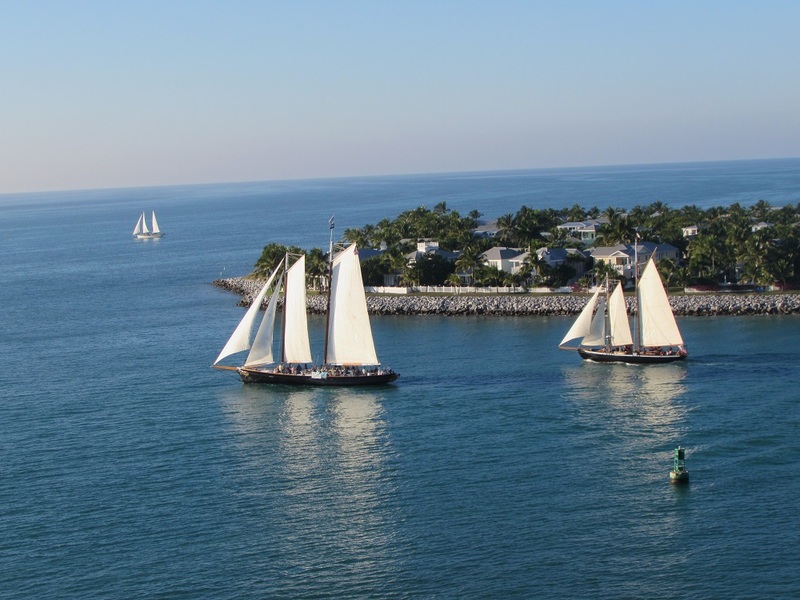 Hello, I’m here via Kate at roughseas and I rather adore Key West. I have a friend who fled suburbia for Key West and has lived there fifteen years now. What a life. Love Kate’s blog — I learn so much about Gib and Spain and being an expat (all of which I knew nothing about until I started reading her blog). Also in love with her dogs. Also among my interests: silver, almost all things vintage, Virginia, and barns. So I’m now following your blog. And yes, Max is the cutest ever. Geez, I see I forget to follow YOU last night when I popped over. So glad you came over here which reminded me immediately. I LOVE history – ancient and otherwise – but am somewhat in a current obsession with American slavery. Living here in Virginia, we see so many traces of the Civil War that it’s a subject hard to ignore. Thanks for following and I so look forward to getting to know you better too!